(WAVE) -In Jefferson County there are young women who have been through things that many people can’t imagine before they turn 18. These young women aren’t just responsible for themselves, they are mothers. With the help of a program that’s gained national attention, many are getting a second chance. Dozens of students and administrators with the Teenage Parent Program known as TAPP went to Frankfort to thank legislators for past grants and ask them to continue funding the Smart Grant. Travis testified to lawmakers that a family member sexually abused her for 13 years. She became pregnant with his baby when she was just 14 years old. “Once when I was eight months pregnant, I was punched in the face and my cheek bones broken, leaving me not only with physical scars but adding to the emotional ones as well,” described Travis. Travis is now 17. She enrolled in JCPS’s Teenage Parent Program, known as TAPP, and things have changed for her. “Immediately they were on my side,” said Travis. “They were there for me. TAPP was a safe place for me, a place that protected me from the cold world I had once called my life. 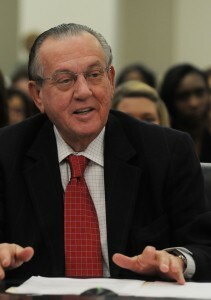 Rep. Larry Clark, D-Louisville, invited 40 of TAPP’s best students to Frankfort to speak to the House Budget Committee. Representatives asked lawmakers to consider reissuing the Smart Grant. TAPP first got it in 2008 and has received about $250,000 each year. It focuses on math, science, and technology. Instead these girls are working to be role models for their kids. Travis has one more year in high school. Funding the Smart Grant is just one piece of the budget that starts in the House. It will fund state government for two years. 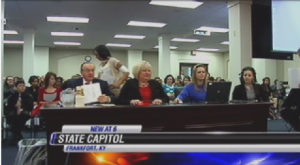 No decision was made on Smart Funding, but all lawmakers who spoke reacted positively. Click here to watch the WAVE TV news coverage.